Our Video Coaching program allows you to work with Linda from anywhere in the world, whenever you want! 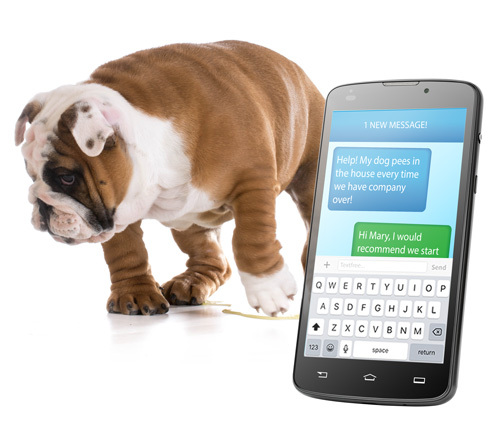 All you need is your dog, your question and a smartphone. Film your question or problem, send in your video, and Linda will send you a detailed response, including video, with specific feedback, ideas, and advice designed to give you results and take your relationship with your dog to the next level. You may submit videos of any specific behavior or problem area, or to get programming strategies from basic through advanced obedience. Experience the power of finally having solutions that will enhance your relationship with your dog without having to change out of your pajamas! But, remember, clothing is mandatory! 1 Video coaching session: $65.00 for a single session, to solve easy problems like jumping, door dashing, trash raiding, chewing, etc. 3 Video Coaching sessions: $195.00 $165.00 for 3 sessions. Shoot a video of your dog engaging in the target behavior you wish to correct, and get a detailed plan with video examples on how to fix it! Share and recieve coaching for one video from Linda. Suggested length between 1 and 3 minutes. Share and recieve coaching on three videos from Linda. Suggested length between 1 and 3 minutes per video. Shoot horizontally. Shooting while holding your phone vertically will reduce the ability to view the necessary details. Shoot close enough to the action that the camera can pick up leash handling from the front or from the side (preferably the left) and from the rear. Hold it steady! If you don’t have a tripod, try resting your phone on a stable surface while shooting, or ask a friend or training partner. Check your lighting. The best videos are shot in natural sunlight. Unlisted videos and playlists can be seen and shared by anyone with the URL address. Receive your coaching video from Linda within 48 hours! Once Linda reviews your video, you will receive an email with a link to view your personalized response. Simple as that! Convenient, economical, no long-term commitments. Learn in the privacy of your own home, at a time YOU choose. Receive the benefits of private instruction with an internationally recognized trainer committed to YOUR SUCCESS, and you don’t even need to put on your shoes! But… we advise that you do… because that would just be awkward! So! Let’s get started with your first video submission! PLEASE double check your email to make sure it is correct! Please include any additional information that you consider relevant.